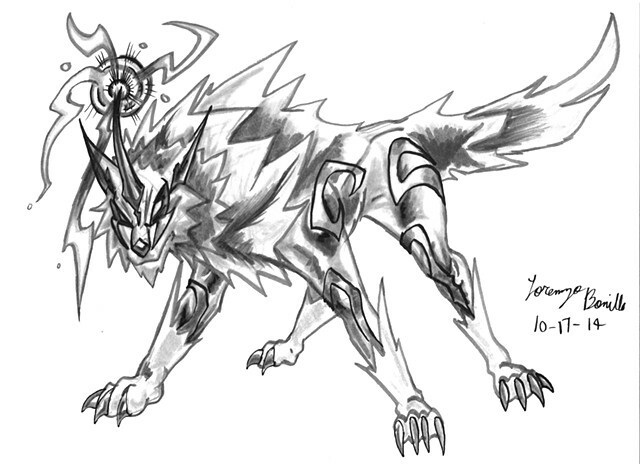 The incredible thunder dogs, the Raiju. These thunder beasts serve the Japanese Lightning God, Raijin and are depicted as white and blue wolves covered in lightning and fly about as balls of lightning. Fiercely loyal to the Lightning God, the Raiju follow and work alongside him on various adventures. Though usually calm, they are strangely easily agitated during thunderstorms and leap around entire areas, causing mild damage with their claws. However, they have the peculiar habit of sleeping within human navels, which annoys Rajin to no end, causing him to fire off his lightning arrows to awaken his beasts. This was probably used as an explanation as to why people get struck by lightning. My depiction of the Raiju is the electric wolf style, but I used the gray marker as my main line work and used the black markers as the detail work. This was to showcase the creature being of pure electrical energy. I made a last minute addition of adding a horn on its head, possibly from watching a lot of Japanese monster shows which often have wolflike monsters sporting horns to channel electrical attacks from them. So I followed suit and have the Raiju have a horn to channel its electrical outbursts.